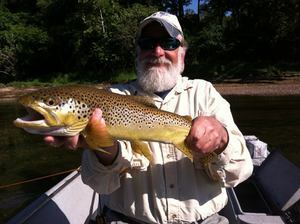 Due to abnormally high water for several years now the trout population has exploded in the White and North Fork rivers. 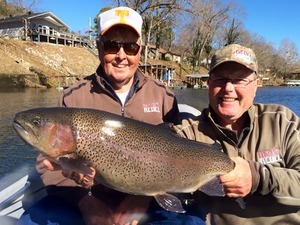 So has trophy trout growth! 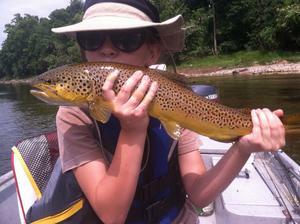 Why Fish With A Full Time Professional White River Outfitter and Trout Fishing Guide? Because you catch more trout, bigger trout, and have more fun! While the White and Norfork rivers hold fantastic trout fishing, you've got to know where those trout will be in any water condition. 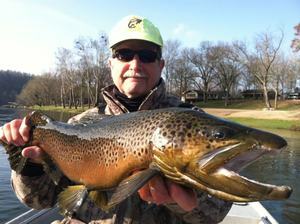 Tailwater fishery conditions change daily in all seasons as water rises and falls. To ensure action-packed trout fishing you have to find trout school concentrations, which can be anywhere along 50 miles of the White river. Licensed and insured professional trout fishing guides like Donald Cranor have the necessary knowledge of where trout schools will be, and most importantly, they have the flexibility of putting in on the best water zone for the day you are fishing. They are not locked into the zone near a dock or resort. And because Donald is a sponsored guide, you'll have the joy of using the most modern top-notch tackle available. At Cranor's Guide Service we conduct trips of all sizes from one to 25 boats for up to 50 people. We'll cook shore lunches for everyone in your party. If you would like help arranging lodging for yourself or your group, we'll be glad to recommend several facilities. Tell us what you'd like and we'll recommend accordingly. Same for area restaurants, attractions, and outdoor recreation.